“Shine bright like a diamond,” is a phrase that can be understood in a variety of ways, depending on the diamond light source. In fact, there’s often a noticeable change in how a diamond appears in sunlight, in candlelight, and under artificial light. 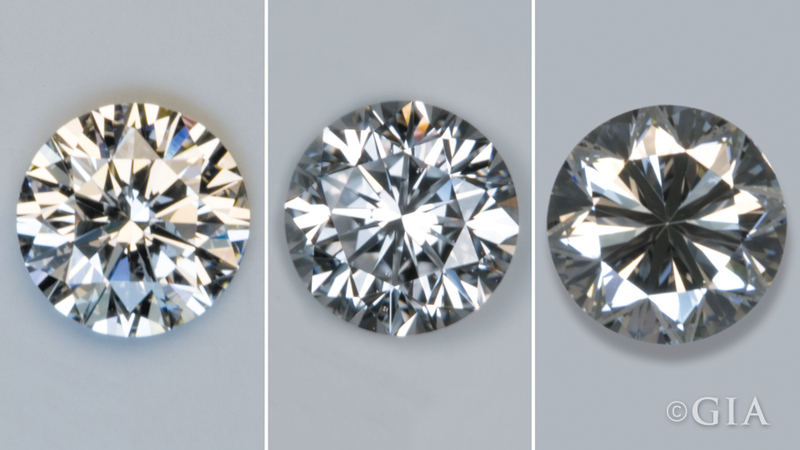 This change proves the importance of understanding how light affects a diamond’s appearance. Diamond cut is often confused with shape, but they are very different. Diamond shape refers to the general silhouette or outline of the stone; diamond cut refers to its facet arrangement. Of the 4Cs of diamond quality (color, clarity, cut, and carat weight), cut is the most complex and technically difficult “C” to assess. The proportions, facet arrangement and finish (quality of polish and quality of symmetry) constitute what we call cut. 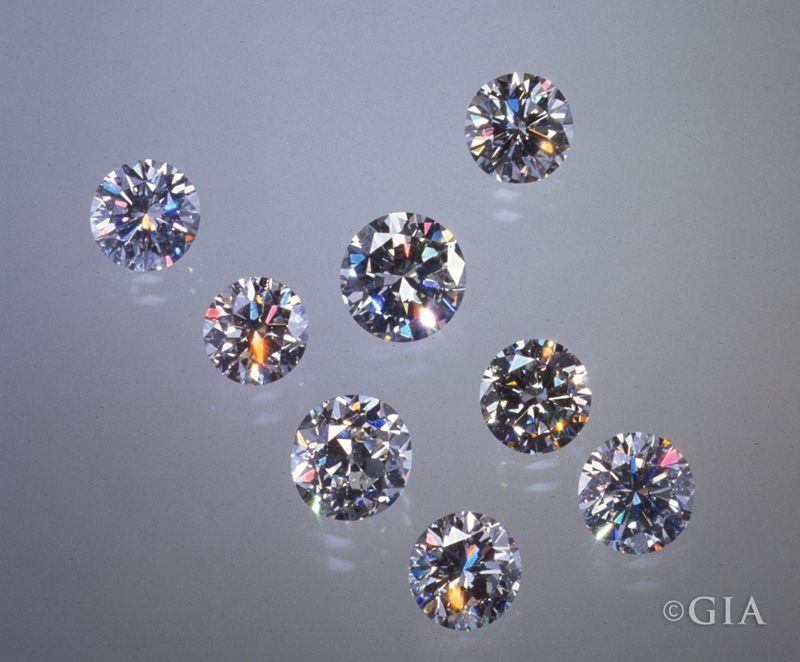 These define the diamond’s ability to transmit light and sparkle so intensely — proving the quality of cut is crucial to a diamond’s final beauty and value. A diamond’s facet arrangement is key to understanding how your diamond interacts with light and its surrounding environment. Think of your diamond’s facets as a complex series of mirrors reflecting the environment. A round brilliant colorless diamond has an astounding 58 facets or “mirrors” that show the reflection of its surroundings, including you. Every time the diamond moves, or if you move past the diamond, you see a mesmerizing display of glinting lights and colors, as light reflects on the facets and the facets reflect light on each other. This symphony of reflected light is made up of brilliance (the total light reflected from a diamond), fire (the dispersion of light into the colors of the spectrum), and scintillation (the pattern of light and dark areas and the flashes of light or sparkle when a diamond is moved). Try it for yourself: See how the diamond changes its look depending on how far or close you hold it from your gaze. It will also respond differently to a diffused lighting environment – for example, fluorescent light bounced off of a white ceiling. Or to an environment with a dark ceiling and spot lighting only. And its look will even be influenced by the color and lightness or darkness of the clothing you wear. As you shop for diamonds pay close attention to a diamond’s interplay with light and your personal preference for the pattern of light and dark areas caused by the reflections within the diamond. Ask your jeweler to show you diamonds under different lighting conditions so you can compare looks between store lighting and daylight or incandescent light. Consider the lighting conditions you’ll wear the diamond most, and ask to view the diamond under those conditions. For example, if you work in an office under fluorescent lighting, ask to see diamonds under fluorescent lights until you find that one diamond whose sparkle and brilliance seems to speak just to you. And once you’ve purchased your diamond, remember that facets are like mirrors and mirrors work best when they’re clean. So to maximize your diamond’s play with light, make sure to keep it clean by following these simple diamond cleaning tips. It’s captivating to see how a diamond’s appearance can change in relation to its surroundings. Seize the opportunity to find out which kind of light complements your diamond best by exploring different environments. Diamond cut quality and the surrounding environment play a significant role in how light interacts with the faceted stone. What scenery do you think maximizes your diamond’s brilliance? To enjoy another gemstone’s reaction to light, you might also like alexandrite’s color change. Check it out in Phenomenal Gems. I just love the beautifully crafted diamonds. I understand the value of the diamonds increase with that. The article gave a thorough idea about all.